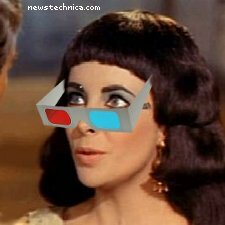 Cleopatra The Musical – in 3-D! Still of Elizabeth Taylor from the 1963 film version. With added 3-D! The poster asserts that the use of the still is fair use under US law for purposes of political and satirical commentary.